Tips and ideas for teachers. Recently I have read many articles and attended professional developments about giving students more autonomy and independence in the classroom. My school has adopted the Kathy Walker inquiry approach in the lower years, and I really like the idea of more choice and differentiation, but I didn’t want to become overwhelmed. I decided to start small, with just one hour a week of completely student-directed learning. My starting point was talking to students and parents. It seemed that all students felt they’d like to do better on their reports, and some were disappointed with their grades (we give a C as a standard mark, B represents six months ahead of expected achievement, and A equates to 12 months or more ahead). Most students said they’d really like to get at least one or two A’s on their reports. I asked the students to write down their areas of interest in the curriculum. Most chose ICT, History, Design, Geography, and Economics. During the mid-year holidays I wrote up an open-ended project for each of these areas that covered all the expectations but allowed a range of options, then presented the projects to the class at the beginning of term. I explained, in our first session, that if students completed one of the projects successfully they would be guaranteed an A in that area. However, they could work on any other project of personal interest and that was fine too. They would have one hour, each Friday, to do what they liked. They each took a sheet from their area of interest and I waited to see what would happen. As it turned out, pretty much nothing at all happened with the projects I’d designed. They were too complex, too detailed and not open-ended enough and, to be honest, they were dry and boring. But, thankfully, the students had ideas of their own. I decided to spend half the term letting the students experiment and I would just observe. No pressure to finish anything, no rules, no structure for that one hour – except my mantra: ‘teach, learn, create’. As long as the students were doing one of these things then that was fine. Unsurprisingly, Genius Hour was a hit. Even if the students did insist on calling it ‘Happy Hour’ for the first term. 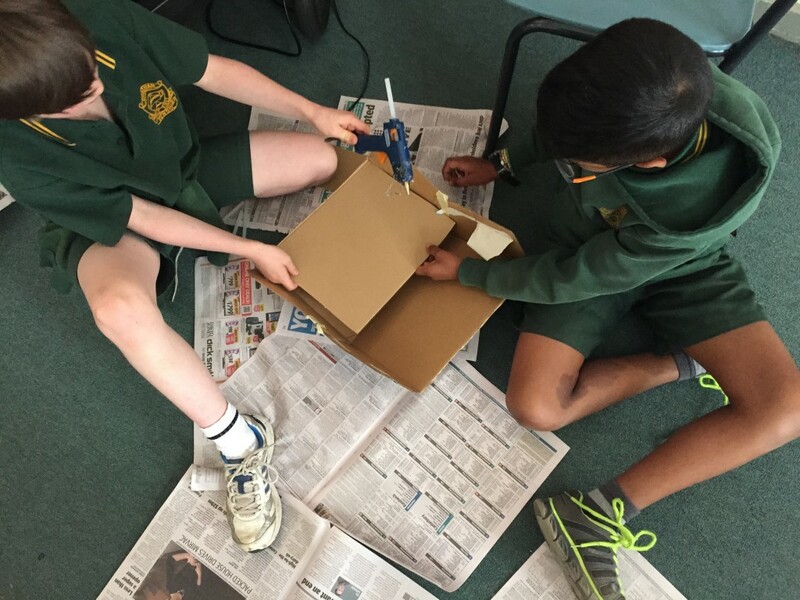 They leaped into projects without hesitation, immediately asking for cardboard, glue guns, iPads, paint, stanley knives (gulp!) and much more. Every time I thought ‘hrm… it looks like A and B are just messing around’, I’d be proven wrong when their ‘messing around’ resulted in something astonishing. 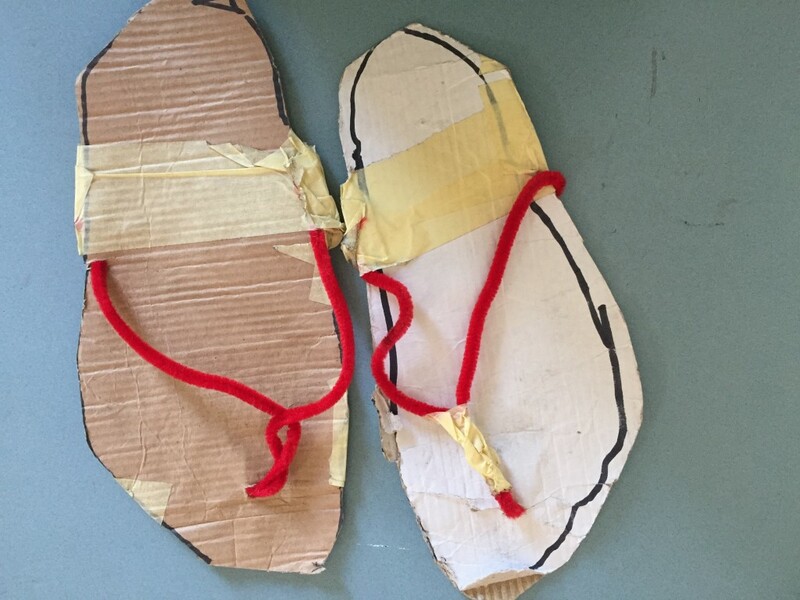 a pair of cardboard shoes that were sturdy enough to be worn around the classroom (and proved useful on hot days). a hat with a working catapult on top (only used to fire paper balls). a research project on the history of cameras. a series of lessons introducing students to the basic elements of karate. a maze game programmed in Scratch. My immediate impression was that this freedom allowed all students to do something amazing and gain recognition. One example was a student who taught a series of lessons in Minecraft. He spent thirty minutes each week with a small group of devotees, explaining carefully and demonstrating, answering questions and taking his role as seriously as an university lecturer. Respect from his peers soared, and he was labeled the expert in this area, frequently sought after for help and advice. A secondary benefit was that each student’s project presented new ideas to the rest of the class. They shared techniques, opinions and skills. It was fantastic to watch them get interested in what else was going on in the room and lend a hand or offer advice to people whom with they did not normally socialise. At the beginning of term four I decided to incorporate more reflection and planning into the sessions and made up an initial planning sheet, on which students had to be explicit about their goals and break them down into steps, with the understanding that they had to reflect on their progress after a month. They were welcome to change their goal but they had to explain why they had switched and what they had accomplished. Students could have projects that were one lesson long, or plan to take the whole term. Anything was ok, as long as they were learning, creating or teaching. 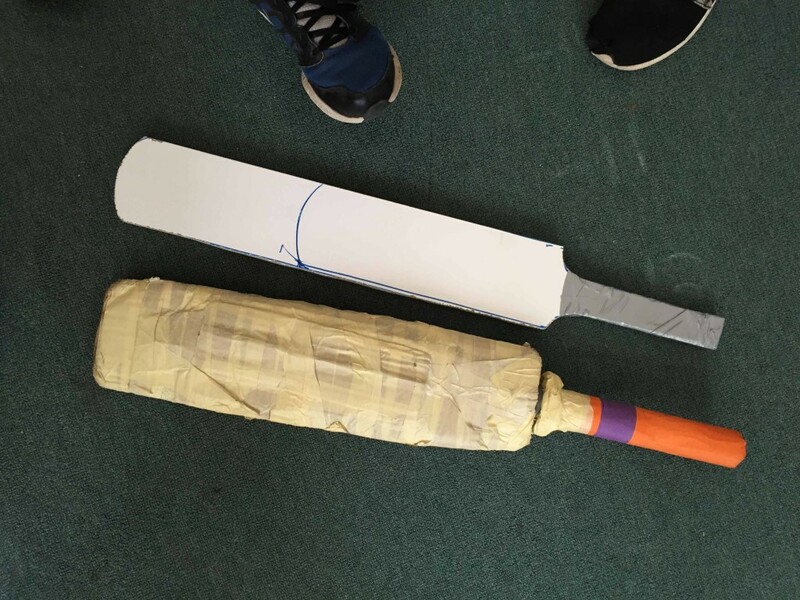 The lower cricket bat is the first prototype, made from cardboard and tape, the upper one is the last design. The boys asked a classmate who was an expert with wood to make their design at home. Unforced, natural collaboration with a purposeful result. As I write this, we’ve just completed our second assessment form, which entailed reflecting on their achievements and use of time during the first four weeks of term, then planning the next four weeks, which will take us up to Christmas. I’ve just begun working on my own Genius Hour project alongside the students. I need to spend time in each session helping students with resources, but I think there would be a great benefit in them seeing me go through the same process as them and then model reflective and critical thinking. My first project? A short movie about Genius Hour, of course. I’m teaching myself to put a movie together using just my phone. We’ll see if it works! Next year I’d like to use a diary to get more concrete reflection done, and more often. I don’t want to cut into the full hour of project work though, so I’d like to extend the hour to 90 minutes. I’d also like to keep a large-format class diary to reflect on our progress as a group. I’d also like to steal an idea from the Kathy Walker program, and have a reporter and photographer each week and focus on a couple of students and get them to share at the end of the session. I’d use Seesaw (a fantastic digital portfolio app) to record snippets of students mid-project. It would also be a good way to teach students how to produce good quality video and audio. An attempt at a mirrorball, following on from our Science unit on ‘Light’. Experimenting with this idea, and seeing how well the students respond to having more control over their own learning, has changed my teaching in other areas. This term our concept has been ‘The Future’ – a new unit of work that has been, without question, one of the most fun and engaging units I’ve ever taught. Although ‘taught’ feels like the wrong word. Facilitated? I was inspired by another teacher’s post on student-directed learning and so I consulted with my class about what aspects of technology and the future they were interested in. We made a list, voted on which we liked most and then broke it down week by week. So far we’ve learned about; 3D printing, drones and transport, artificial intelligence and now we’re up to cloning. The students wanted to celebrate Back To The Future Day (fortuitously, it occurred during this term) and we’ve watched plenty of YouTube videos on new technologies, discussed Isaac Asimov’s Law of Robotics, learned about the power of crowd funding, watched (online) the first road test of an autonomous vehicle in the southern hemisphere… the list goes on. For homework, the student chose their own topic to research and had to present a timeline that covered the history of their area but also projected into the future, then make a model or diagram showing their predictions. I’ve never had such a high standard of homework returned. Putting power back into the hands of students has led to some of the most memorable teaching moments I’ve had in a long time. The benefits for students are many, but in concrete terms it has allowed them more opportunity to demonstrate to me a range of skills that will translate to higher report scores, particularly in the areas of personal learning, creativity and design, thinking processes and ICT. I’m really looking forward to applying what I’ve learned here across the curriculum next year and learning even more from my students. I’m also very interested in hearing about others experiences with any similar styles of learning and would love advice or ideas. Feel free to leave a comment! I’ll finish with an excerpt from a piece of writing from one of my students. I asked them to write a letter to the Grade 4’s and tell them about what they’d enjoyed most about Grade 5. While over half the class put Genius Hour in their letters (they only had space to write about their top 4 experiences), I felt this child really encapsulated the heart of the experience… while at the same time expressing this student’s fabulous sense of humour. 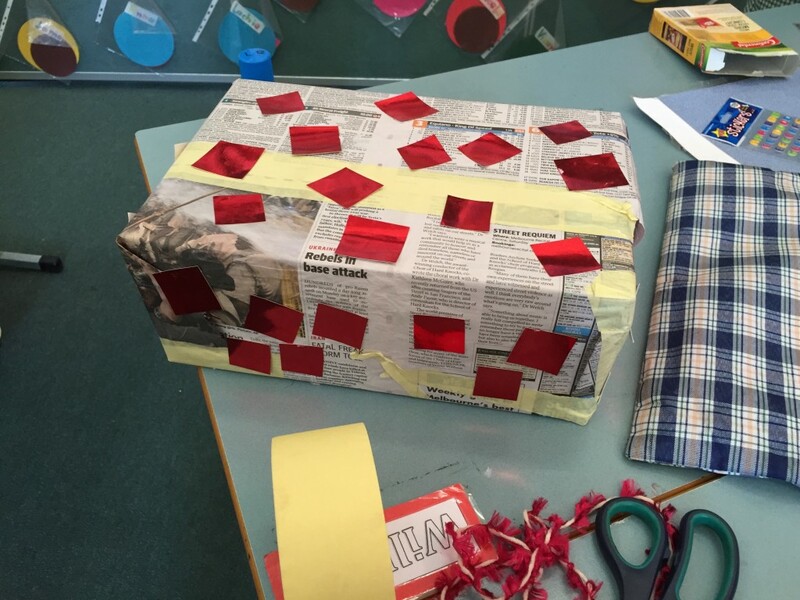 This entry was posted in Uncategorized and tagged Australia, Genius Hour, humour, Melbourne, philosophy of teaching, self-directed learning by amandalenon. Bookmark the permalink. Thanks for sharing this Amanda. I love how you set the whole program up and I’ve been inspired to implement it in my classroom next year. It really helps to read a detailed description of how something works. I’ve run quite a few “work of choice” sessions this year where students have mostly chosen to work on writers workshop pieces but I’ve noticed they’ve gotten a bit sick of this by the end of the year and there are plenty of other subject areas they could be working on. I forgot to mention in the post that we’re having a ‘Genius Day’ on Tuesday the 8th, feel free to drop by and see what they’re all making! Have put date in my diary to come and visit! Amazing what the students are saying, thinking, feeling and doing. Oh, and achieving! I am sure there is no reluctance to come to school, every student feels valued and success criteria is built in. There is the accommodation for every child no matter where there learning is at and learning challenges they may have. I can also see relationship development, collaboration and respect are also integral in your classroom. Thanks for sharing and providing further detail on how Genius Hour works in your classroom Amanda! It’s been great to get regular updates from you about how Genius Hour has been going for you and your students over the last two terms. Being your neighboring teacher, I’ve been very lucky to witness first hand just how much the students have enjoyed this. They have been so motivated and engaged in their learning. I have been highly impressed by the wonderful ideas and innovative creations that your students have produced. Amanda, your enthusiasm is contagious and you have inspired me to run Genius Hour in my future teaching. It’s really inspiring reading about how excited your class has been about learning! So You’re Moving To Victoria To Teach? Mindfulness and the Joy of Student Teachers. amandalenon on So You’re Moving To Victoria To Teach? Puneet Kaur Batra on So You’re Moving To Victoria To Teach? Celia C on What Makes A Good Teacher?